The Bolst family of Bangalore have been involved in the selection and preparation of Indian food ingredients since 1932. They have a well-deserved, international reputation for producing fine Curry Powders, Pastes, Pickles, Achars and Chutneys, with many of their products achieving cult status across the world. 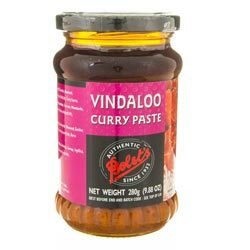 • Marinate 500g pork (or your choice of chicken, meat, seafood or vegetables) with 1 tbsp Vindaloo Curry Paste for 30 minutes. • Fry 1 sliced onion in 2 tbsp oil over a medium heat. Add 1 sliced tomato and cook for a few minutes. • Add the pork, salt to taste and 2½ cups water, cover and cook until tender. Add boiling water if more gravy is required. Serve hot, garnished with coriander leaves, with Indian Breads or Rice and Bolsts selection of Pickles, Achars or Chutneys. Ingredients: Sesame Oil, Water, Peanut Oil, Turmeric, Mustard, Ginger, Garlic, Cumin, Chilli, Salt, Acetic Acid, Curry Leaves. "Dear Spices of India, Many thanks. Beautifully packed and arrived here - on Dartmoor! - before 8am this morning!! 'till next time. Regards,"